Oh my stars. 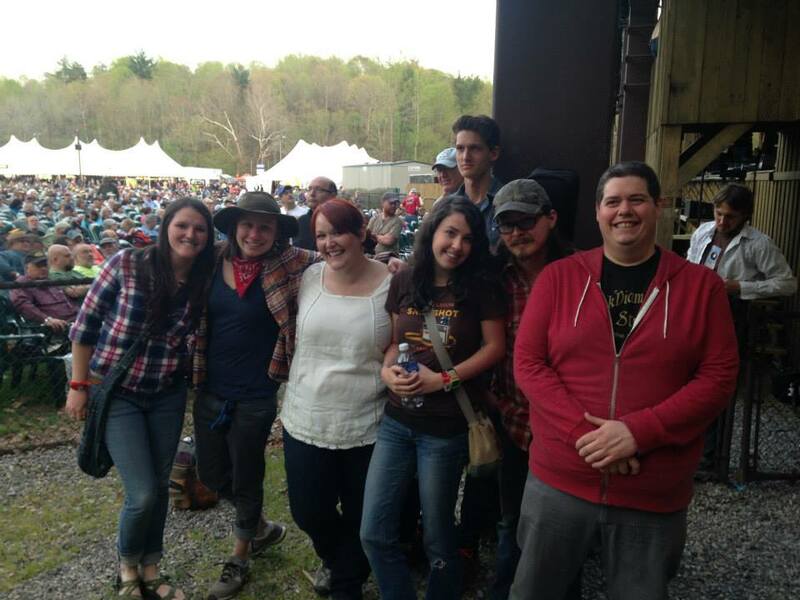 How do we even begin to describe our EPIC MerleFest experience?! Holy cow: it was one for the books. We had the most AMAZING weekend on record. Everyone was so cool. We had a blast meeting new friends and bands, cheering for our dear friends in Asheville bands as they made their own waves, & seeing our heroes backstage and perform. And I'll tell you what, that Midnight Jam rawked!! WOW. HUGE thanks to Steve Johnson and the entire MerleFest crew that made our time there the best EVER. We are so grateful!! John Looney, Dakota Waddell, & Anna Kline. Not pictured: Our fiddle player, Julian Pinelli, who CRUSHED it. Doc & Merle Watson Performing Arts Showcase, Austin Stage. Spring has finally hit the mountains, even after we had another quick snow just days ago. We hope you are enjoying the sunshine. Here's what we've got going on for April! I'll tell you what. Just when you think nothing's happening, the fire is stoked and life gets interesting! We got a small mention in the April issue of Southern Living Magazine. A friend gave us the heads up and sure enough, there we were! What?! Yeah, that's us alright. We are so excited to be playing at MerleFest this year -- what a great line-up they've got! It's going to be a fun and busy weekend -- performing, jamming, and making new friends. The band will be performing at the Doc and Merle Watson Performing Arts Showcase on Friday, April 25, at 1030am -- you can read more about the showcase and the performers here -- our Asheville friends Locust Honey String Band will be performing right before us. Then we'll be appearing later that day at 445pm on the Plaza Stage. Stop by and say hello! In other great news, we've been added to the line-up of the 'Cuegrass Festival in Raleigh, Saturday, April 26. We are thrilled to be playing at 315pm, right before the festival headliners, The 23 String Band!! What's Coming Up for Us! We have lots of news to share with you! While we are looking forward to MerleFest next month (understatement), we have also been adding a lot of shows and festivals to the calendar. STAY TUNED because we have even MORE upcoming announcements for festivals and showcases this year. FO REAL.